The NASA.gov team was very happy today to learn that the Agency’s website has been nominated for the sixth time for the Webby for government sites. It’s always an honor when any group compliments the site, but we get really pumped when it comes to the People’s Voice Award. 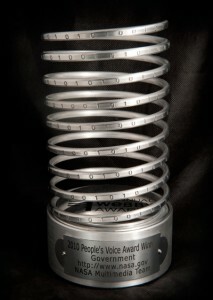 The Internet community has awarded us five People’s Voice Awards, including four in a row from 2009 to 2012. We take that as a significant endorsement that we’re running NASA.gov effectively for its primary audience – you, the public. We’ve got various metrics, including traffic and customer-satisfaction data, that tell us we are generally getting it right, but a direct vote of confidence like this is even better. NASA.gov represents the work of dozens of people across NASA, including content editors, infrastructure vendors and staff from our CIO office, Communications and all NASA offices and centers. Together we are a 24/7/365 news operation working to bring you news on all of NASA’s programs whenever it happens. 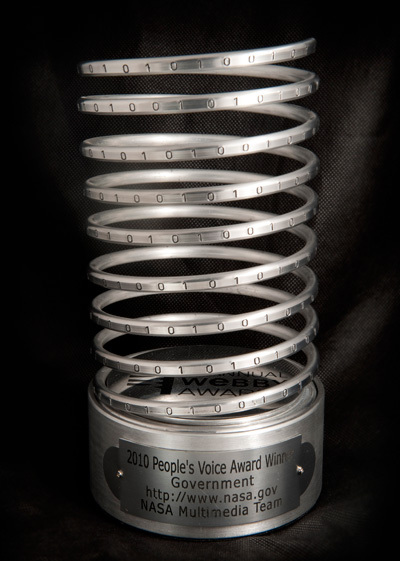 Now you have the opportunity to speak your mind again, by voting in the 2014 People’s Voice Awards. (You will have to create a user account and presumably allow a cookie or other tracking technology to be used, as the Webby organizers are trying to prevent multiple votes from any account.) Once you’re signed in, you can search for NASA or find us under the Web > Government category. NASA.gov is up against other worthy sites, of course, including our federal colleagues at NOAA for climate.gov. All of the nominated sites reflect a lot of hard work on someone’s part, so give them a look and cast your vote for the one you think best represents government on the web. And whether you vote for us or not, thank you for your support over the years.